St. Frances X Cabrini will expand its technology programs to better serve its student population between the fall and spring of 2018-2019. The principal, Mrs. Carmen Orinoco-Hart, and the faculty are working toward a one-to-one ratio of students to electronic devices in the classroom. One student who has benefited from the use of technology in the classroom is 2nd grader, Benjamin Cuellar. 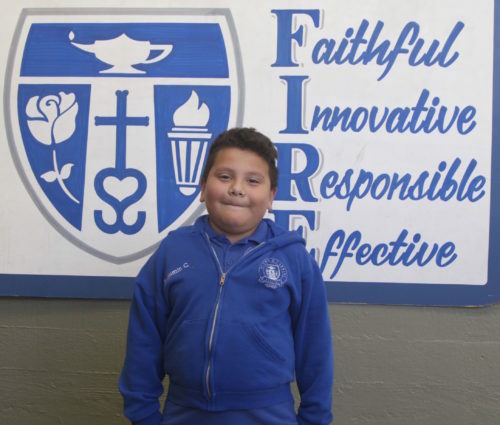 Upon starting school at SFXC, Benjamin was placed on a special education IEP (Individualized Educational Program). He has advanced tremendously from the individualized lessons he received in Mrs. Reyes’ 2nd grade class. These lessons and testing often take place on electronic devices in the classroom. As a result of his perseverance and with the thoughtful instruction provided by Mrs. Reyes, Benjamin flourished and has advanced beyond needing to be on an IEP. Benjamin is extremely proud of himself, as you can see in this picture. The integration and expansion of technology programs at SFXC can help more students improve their test scores and learning benchmarks. St. Frances X. Cabrini Parish School is a community of students from Kindergarten through Eighth grades. The school is a diverse ethnic community, which is 45% African-American, 53% Hispanic, 1% multi-racial and 1% Asian. Sixty-seven percent of our students list themselves as Catholic; the other thirty-three percent are of Protestant Christian denomination. Approximately ten percent of the students attending St. Frances X. Cabrini School are children of alumni. St. Frances X. Cabrini student base is drawn from a wide geographical area including the cities of Los Angeles, Compton, Inglewood, Garden, Long Beach, Norwalk, South Gate, Bell Gardens and Carson. Parents and Guardians state that it is the tradition and charism of the Dominican Sisters of Mission of San Jose as the Catholic Education Foundation that maintain important factors in the percentage of families that come to St. Frances X. Cabrini Parish School.